snap a photo, support real wildlife! Safari Central features six real animals living in the wild. learn more about the lives of our wildlife stars and how your in-app purchases help our conservation partners protect them*. Don’t let her name fool you. Rockstar the pangolin is shyer than most other Temminck’s pangolins of the Tswalu Kalahari Reserve, and likes to stay close to the creature comforts found in her area of the sand dunes. Like all pangolins, Rockstar curls into a ball so that her scales can protect her from predators. Sadly, it is these scales that make her species vulnerable to poaching. Rockstar is safe at home, however, as the Tswalu Foundation and University of Witwatersrand work to protect her from threats such as illegal trafficking and climate change. There are eight different species of pangolin – four in Asia and four in Africa. Pangolins are the most trafficked mammal in the world, primarily because their scales are used in traditional medicines. Pangolins have extremely long, sticky tongues specialized to eat certain ant and termite species. Once a pangolin curls into a ball, it is almost impossible for a predator to get through its tough scales. Lions and spotted hyenas are their primary predators in the southern Kalahari. Pangolins walk on their hind legs and use their big, muscular tails for balance. Pangolin mothers give birth to one pup at a time, carrying the baby on her back for about 4-6 months. Researchers locate the pangolins in their study area at least once a week, using VHF (Very High Frequency) telemetry. This technology allows a tagged animal to be detected from far distances. Once a pangolin’s burrow has been found, a camera trap is placed just outside its entrance in order to snap pictures of its activity. Tracking allows researchers to learn about many behaviors, such as preferred feeding locations and daily travel patterns. Though typically thought of as a desert, the Kalahari region is covered in a wide diversity of vegetation types, ranging from the semi-arid savannas of the southern regions to the dense forests of Zaire. Tswalu Reserve, in South Africa, is arid savanna habitat consisting of undulating dune fields. These are occasionally interrupted by ‘Korannaberg hills,’ areas of higher elevation which receive higher rainfall than elsewhere in the Kalahari, leading to additional habitat diversity. The Reserve also extends into the southern, or “Green,” Kalahari, where the climate spans the extremes. In winter, temperatures fall well below zero, while in summer they will often exceed 40 degrees (C). This climatic and geological variability has led to the evolution of a wonderfully diverse suite of animal and plant life, much of which is still little-known to science. Among the many species that occur in the Kalahari, there is one very charismatic species that clings on tenaciously in this unforgiving environment – the Temminck’s ground pangolin. Tswalu Kalahari Reserve is South Africa’s largest private game reserve, spanning over 1,000 square kilometres and is owned by the Oppenheimer family. The vision for the reserve is to “restore the Kalahari to itself” and through a process of passive and active intervention, nature has been allowed to re-establish itself and strengthen and maintain its essential ecological processes. 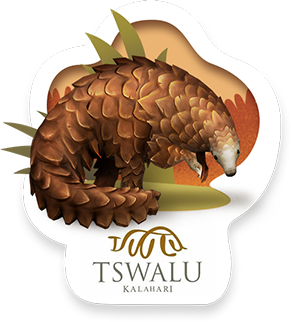 The Tswalu Foundation was created in 2008 as a result of the forward thinking of Jonathan Oppenheimer and his love and interest in the Kalahari. His vision for the Foundation is to develop a platform upon which local and international visitors can contribute and become involved in community and environmental research on the reserve. Through the Foundation we encourage guests to Tswalu Kalahari and individuals interested in the Kalahari to donate towards research projects on the reserve and the surrounding area. The Foundation creates the mechanism to either contribute to an existing research project or to suggest and fund specific research in areas of interest to the funder. 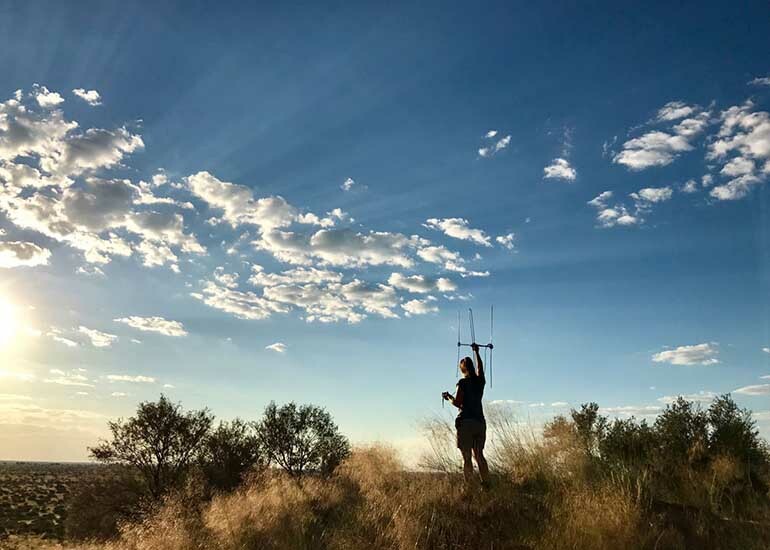 The Foundation provides financial support and logistical support to students so as to develop long term research and monitoring programs on the reserve, thus contributing to the conservation and a greater understanding of the Kalahari. Tswalu Kalahari Reserve acts as a major contributor to conservation of species and ecosystems in the Northern Cape, conserving numerous rare and endangered species. The reserve has a strong conservation ethic and numerous research projects have been sanctioned by the Oppenheimer family. These projects range from insects through to pangolin and contribute to our understanding of the uniqueness, complexity and diversity of this wonderful, arid land. Understanding the relationships and connectivity of ecosystems is one of the major challenges in modern ecology. Although Tswalu Kalahari and the Oppenheimer family have supported several research projects in the past, it became evident that a vessel was required to ensure that more researchers were afforded the opportunity to study this unique land. Pangolins are the most trafficked mammal in the world, primarily because their scales are used in traditional medicines. The 2016 CITES convention banned the pangolin trade, but the illegal market is escalating. Pangolins also face threats such as habitat loss and hunting. Very little is known about this rare animal, so research and public awareness are key to their protection. Your donation to the Tswalu Foundation will help fund research into the ecology, behavior, and conservation of ground pangolins like Rockstar. 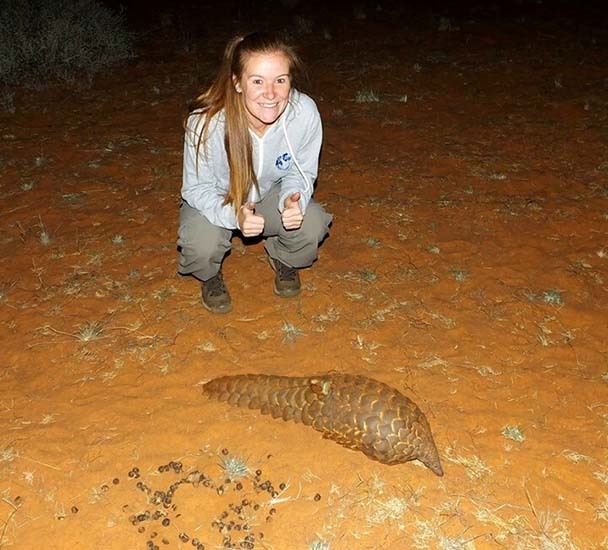 Current research projects include investigations into the impact of climate change on pangolin habitat, and the design of pangolin-friendly fencing. Mweturia is a 40 year old bull elephant who lives in the Laikipia region of central Kenya. He is one of a few bold males that has mastered the art of breaking electric fences in order to raid farmland under the cover of darkness. Mweturia has recently started teaching younger males his old tricks. Because of him and his students, Space for Giants is working tirelessly to better understand crop raiding behavior and to improve elephant fencing technology, so that elephants and humans can coexist peacefully. Generally Mweturia is a pretty calm elephant, but on most nights, he gets up to no good and steals crops, like maize, from local farms. Elephants are the largest land mammal in the world, and can live to over 70 years old. Elephants are highly social & sensitive. They express grief, compassion, self-awareness and altruism. Both male and female African elephants have tusks. They show preference for one tusk, in the same way we are left or right handed. Tusks are used for defence, lifting vegetation, and digging for food and ground water. An elephant’s trunk is made up of 40,000 unique muscles. Dedicated conservationists are working tirelessly to protect elephants from poaching and to prevent human-elephant conflict. Laikipia County is one of East Africa's most important areas for wildlife conservation. It supports higher populations of large mammals than any other protected or unprotected landscape in Kenya, outside of the Maasai Mara National Reserve. This includes the second largest elephant population, which, combined with neighbouring Samburu County, numbers an estimated 6,365 individuals. Laikipia County is a landscape mosaic of different land tenures, including large scale private lands, government holdings, and small farms. The vegetation is very diverse, ranging from savanna grassland and open woodland in the north to upland forest in the south, which lead up to the slopes of Mt. Kenya. Space for Giants is an international nonprofit working in Kenya, Botswana, Gabon, and Uganda to safeguard forever Africa’s vulnerable elephant populations and the landscapes they need to thrive. 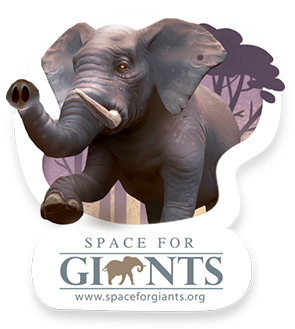 With innovative and proven activities, Space for Giants confronts acute threats like the ivory trade and long-term challenges like balancing the needs of wildlife and growing human populations. Space for Giants delivers anti-poaching initiatives, secures protected landscapes for elephants, and reduces human-elephant conflicts. Despite a ban on the international trade of ivory, which was introduced in 1989 by CITES, the demand for ivory in Asia and the United States continues to drive unsustainable poaching and trafficking. From 2010 to 2014, the wholesale price of raw ivory in China tripled to US $2,100 per kilo. In addition to poaching, land conflict between humans and elephants poses a serious long-term threat, as growing human populations demand greater living space. Fragmented habitat and competition for land cause human-elephant conflicts. Gaining the support of local communities in the protection of elephants is critical, and depends upon developing the right solutions for coexistence. Your donation to Space for Giants will go directly toward the West Laikipia Fence Project, which addresses unsustainable human-elephant conflicts. The project will result in the construction of approximately 100km of special elephant fencing. This special fence, with protrusions called outriggers (metal wires that carry an electric charge), will help prevent Mweturia and his associates from entering into community lands. This will help secure the livelihoods of the people who live alongside elephants, build tolerance towards the species and help to keep elephants safe from retaliatory killings. Atiaia, (ah-tee-eye-ah) meaning “the one who brings light,” is one of the few remaining jaguars in the Iguacu National Park. Atiaia is quite the local star, drawing public attention to the magnificence of her species via camera trap images, which scientists use to understand her behavior. Recent sightings show Atiaia with a new cub, providing hope for all who are following her story. The Iguaçu Carnivores Project, supported by Pró-Carnívoros and WWF-Brazil, closely monitors jaguars in order to safeguard the health of the entire Iguaçu ecosystem. Atiaia is a very calm jaguar, good mother and very careful with her cubs. Jaguars stay with their cubs approximately until they are 2 years old, teaching them to hunt and survive alone. Atiaia is not frightened by the tourists, who are quite delighted when they can see her. The jaguar is the largest cat and the top terrestrial predator in central and South America.Its diet consists of deer, peccaries and other small vertebrates. Jaguars do not meow like most felids; they emit a series of very strong snores, which are called ‘roars’. Forest loss and fragmentation have been the main causes of the decline in jaguar populations, but poaching, conflicts with livestock farmers, and roadkills pose additional threats. It is estimated that only 200 jaguars remain in the South American Atlantic Forest. The jaguar is considered an ‘umbrella species,’ in that its large territorial requirements encompass those of other species. So, focusing on protecting the habitat of jaguars is an efficient way to protect the diversity of the entire system. Once covering nearly one tenth of the South American continent, currently the Atlantic Forest is a fragile treasure, significantly reduced in its extension and scattered in hundreds of thousands of fragments. While it remains one of the most diverse, rich and distinct forests on Earth, it will require an enormous effort from society to ensure its continuing existence for the coming generations. Composed of tropical and subtropical rainforests, the Atlantic Forest is actually a complex of 15 terrestrial ecoregions, stretching along the Brazilian Atlantic coast, and inland to north-eastern Argentina and eastern Paraguay. The lands originally covered by the Atlantic Forest are today predominantly a human-modified landscape, retaining only 16.8 per cent of the original forests. The Atlantic Forest possesses not only an extraordinary diversity of species, but also an exceptionally high number of endemic species - species which are not found anywhere else on Earth. The importance of this ecoregion for global biodiversity is extraordinary: 7% of the Earth’s plant species and 5% of its vertebrate species are found in the Atlantic Forest. 443 species of trees were recorded in just one hectare! This noteworthy biological richness must coexist with a highly concentrated human population, particularly in Brazil. Two of the 30 largest cities in the world – Sao Paulo and Rio de Janeiro – are located in the heart of the Atlantic Forest. The growing population here places enormous pressure on the Atlantic Forest's ability to sustain diversity and health for both animals and humans. Pró-Carnívoros, WWF-Brazil, and Vida Silvestre Argentina initiated an intense effort in 2003 aimed at securing the survival of the jaguar population in the cross border area of Argentina, Brazil, and Paraguay. Since then, there has been an increase in the jaguar population, thanks to the collaborative efforts between non profit organizations, researchers, and the public. Your donation to Pró-Carnívoros goes directly to land management efforts which use camera trap monitoring to identify and protect key habitats and corridors essential for jaguars like Atiaia and her new cubs. Beby is a blue-eyed mama lemur, living with her family of five in the rainforest of Madagascar. Her species, the Indri, is famous for its song, and Beby begins her day by singing louder and longer than her family members. Together, they search the forest for delicious leaves to eat, until it’s time to find a safe place to sleep. Because the critically endangered lemurs desperately need protection from hunting, Conservation International is working with schools to help build a strong community of lemur advocates. There are approximately 100 species of lemurs, which are primates endemic to (found only on) the island nation of Madagascar. The indri is the largest species of lemur, but it can hop from tree to tree quite gracefully. Indris never come to the ground. They eat, sleep and socialize in the mid canopy layer of forest trees. Indris are monogamous and territorial, and their famous song serves as communication with family members and other groups. Lemurs are considered the most endangered of all mammals, facing pressure from hunting and habitat loss. The Ankeniheny-Zahamena Corridor is a treasured rainforest in eastern Madagascar and home to a rich diversity of species. Over 2,000 species of plants, 129 species of amphibians, 89 species of birds, and 15 species of lemur rely on this habitat for survival. Indris and other lemurs are critically endangered due to logging and hunting. Working with local communities to develop alternative sources of food and income is critical to protecting lemurs like Beby and her family. Your donation to Conservation International will go directly toward a community-based forest protection program, which benefits both people and lemurs. Villagers train and work to collect scientific data, destroy lemur traps, contribute their knowledge and perspectives to conservation planning, and patrol the forest to protect it from illegal activity. Meanwhile, school children are engaged to become lemur advocates for life. Ethyl is a 20-year old grizzly bear who likes to wander - a lot. Tracking data shows that she walked over 2,800 miles through Montana and Idaho in 3 years. She crossed high mountains as well as highways, apple orchards (from which she was kindly asked to leave - twice), and even people’s backyards. While Ethyl’s journey was unusual, all grizzly bears do require vast areas in which to roam. 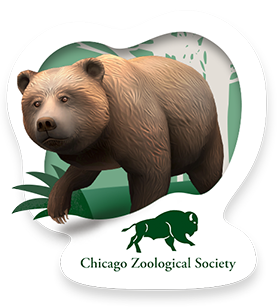 The Chicago Zoological Society and Vital Ground Foundation work to secure safe passage for grizzlies throughout northwestern North America. Grizzly bears are a subspecies of brown bear that once roamed throughout western North America. Now they are limited to isolated patches of protected areas. Grizzly bears tend to avoid humans, but are sometimes lured to garbage and other sources of human food. When their cubs are threatened, they become aggressive. A grizzly’s diet is omnivorous - it includes grasses, roots, berries, nuts, insects, fish, and large mammals, such as deer. Grizzlys hibernate in dens for about 7 months. Pregnant females are the first to enter their dens, followed by mothers with cubs. Solitary males are last to pack it in for the winter. Grizzly cubs stay with their mother for two to three years. After that, they live fairly solitary lives, but will occasionally join others for a good meal. Grizzly bears use and cross a variety of North American habitats within subalpine mountains - preferring river valleys, montane forests and open woodland. They play an important role in regulating prey species and spreading nutrients and seeds. Since the opening of Brookfield Zoo in 1934, the Society has had an international reputation for taking a cutting-edge role in animal care and conservation of the natural world. Today, there is an increasing need for conservation leaders to guide, teach, and motivate people to protect the world’s threatened wildlife and ecosystems. In addition to conservationists, the Society inspires and engages children, students, teachers, and others among the general public to make a positive impact on the natural world around them. Chicago Zoological Society’s conservation and research programs expand far beyond the boundaries of the zoo. We support a wide range of field work, from grant-supported projects at wildlife refuges and habitats to release programs that return animals to their natural environments. The Vital Ground Foundation conserves private land for grizzly bears and other wildlife in the northern Rocky Mountains. We also support programs that reduce conflicts between bears and humans. Lola is a 10-year old female black rhino living on Ol Pejeta Conservancy in central Kenya. Lola was orphaned at birth and needed a lot of help from loving caretakers. She now roams free throughout the Conservancy, often in the company of her friend Nabuul, who was also rescued by Ol Pejeta as a young calf. Everyone is eagerly awaiting the day that Lola has a baby of her own. Ol Pejeta employs rangers to keep 24-hour watch over Lola and over 110 other black rhinos to protect them from poaching. Lola was born on 5th May, 2007. Unfortunately, her mother Mawingo was partially blind and hence unable to offer adequate care & protection for her. This caused Mawingo to separate from Lola, two weeks after her birth. Lewa Conservancy staff found Lola in the thick bushes and hand reared her (and her older brother, Elvis). When she was three years old, Lola sustained injuries inflicted on her by another male black rhino, and was at risk of death. This prompted her transfer to Ol Pejeta Conservancy in June of 2010. At Ol Pejeta, Lola was placed in the Endangered Species Enclosure, where she developed a bond with another orphaned rhino, Nabuul. In 2014, Lola and Nabuul were released from the enclosure and ventured out into the wild. They had reached the age of sexual maturity and there were no males within the enclosure with whom they could mate. Lola was able to adapt very quickly to life in the wild, under the close supervision of Ol Pejeta wildlife monitoring teams. She is still occasionally spotted hanging out with her old friend, Nabuul. The black rhino is smaller than the white rhino, although adults can still reach 1.5 metres in height and weigh in at 1.4 tonnes. The species is distinguished from the white rhino by a prehensile upper lip (hence the alternative name of hook-lipped rhino), which it uses to feed on twigs of woody plants and a variety of herbaceous plants. Adult black rhinos are mostly solitary. Mother and daughter pairs may stay together for long periods of time, while a female without offspring may join up with a neighbouring female. Black rhinos may reach 40-50 years of age. Black rhinos were once found throughout sub-Saharan Africa, with the exception of the Congo Basin. However, relentless hunting by European settlers and poaching for rhino horn have caused their numbers to quickly decline. hanks to successful conservation and anti-poaching efforts, the total number of black rhinos has grown to around 5,000. The species is currently found in patchy distribution from Kenya down to South Africa. However, almost 98% of the total population is found in just 4 countries: South Africa, Namibia, Zimbabwe and Kenya. Ol Pejeta currently works to a coverage rate of one rhino patrol team to 3,500 acres within the core conservation area. There is one patrolman per 1,000 acres and every rhino is seen at least once every 3 days. Each rhino is individually identifiable by unique ear notch patterns. Ol Pejeta also operates a number of highly trained armed patrols. These self-sufficient, mobile teams able to spend extended periods of time in the field. They have been trained to operate day and night and to respond to poaching incidents, not only within Ol Pejeta Conservancy, but in conjunction with local authorities outside of the Conservancy. Ol Pejeta Conservancy, East Africa’s Largest Black Rhino Sanctuary, is situated at the foothills of the Aberdares and the magnificent snow-capped Mount Kenya. A mosaic of grass plains, wooded grassland, Acacia woodland and evergreen thicket extend for over 350 square kilometres. Ol Pejeta boasts an astounding variety of animals, including non-indigenous chimpanzees and the Big Five (the endangered black and white rhino, leopard, elephant, buffalo & lion). Ol Pejeta is the largest black rhino sanctuary in East Africa, and home to the world’s last three northern white rhinos. It shelters the only Key 1 (over 100 animals) black rhino population in East Africa. Ol Pejeta is the only place in Kenya to see chimpanzees - a sanctuary was established here to rehabilitate animals rescued from the black market. Ol Pejeta also seeks to support the people living around its borders, to ensure wildlife conservation translates to better education, healthcare and infrastructure for the next generation of wildlife guardians. Every year, nearly 85,000 visitors are welcomed to the Conservancy, and leave with a strong sense of conservation awareness. They are educated on the plight of various endangered species and what it takes to conserve them. In addition, Ol Pejeta’s conservation news reaches over three million people each month across social media and other publications. Uncontrolled hunting in the colonial era was historically the major factor in the decline of black rhinos. Today, poaching for the illegal trade in their horns is the major threat. Powdered horn is used in traditional Asian medicine as a supposed cure for a range of illnesses. The recent surge has been primarily driven by the demand for horn by upper-middle class citizens in Vietnam. As well as its use in medicine, rhino horn is bought and consumed purely as a symbol of wealth. Your donation to Ol Pejeta will help fund the recovery of rhino populations through the employment of rhino monitoring patrols and caregivers for orphans like Lola.